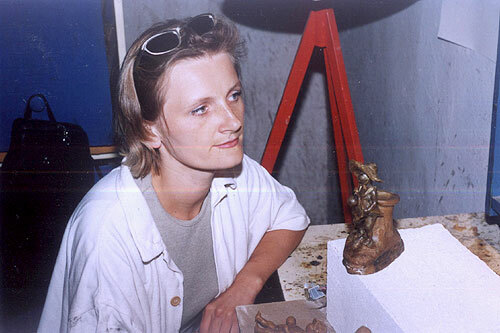 Born on June 25, 1969, in Szczecinek, she graduated from the Poznań Academy of Fine Arts in 1993, receiving a diploma in sculpture in the class of prof. Józef Kopczyński. - - "Zapiecek" Gallery in Warsaw. 2005-2006 - Exhibitions in "Ideal" Hotel in Pruszków. Dorota Dziekiewicz-Pilich's sculptures are part of many private collections both in Poland and abroad, including Germany, Holland, France and Malta. In December, 1996, she won the competition for the design of the statuette of "Fryderyk" - the award of the Polish Phonographic Academy. On April 20, 1997, her sculpture "Little Violin Player" was handed by the then president of Warsaw Marcin Święcicki to the best Polish performer in the Tadeusz Wroński International Violin Solo Competition in Warsaw. • a bronze plaque and a medal for the Władysław Broniewski 8th Elementary School in Pruszków.